At least six people were killed and 28 injured in an attack on a children’s organization in eastern Afghanistan on Wednesday, authorities said. A vehicle packed with explosives was detonated outside the office of Save the Children in Jalalabad. At least three men then stormed the office with AK-47s and rocket-propelled grenades, officials told ABC News. Afghan security personnel gather near an office near the British charity Save the Children after an attack in Jalalabad, Jan. 24, 2018. The attack began around 9 a.m. local time, according to Attaullah Khogyani, a spokesman for the provincial government. 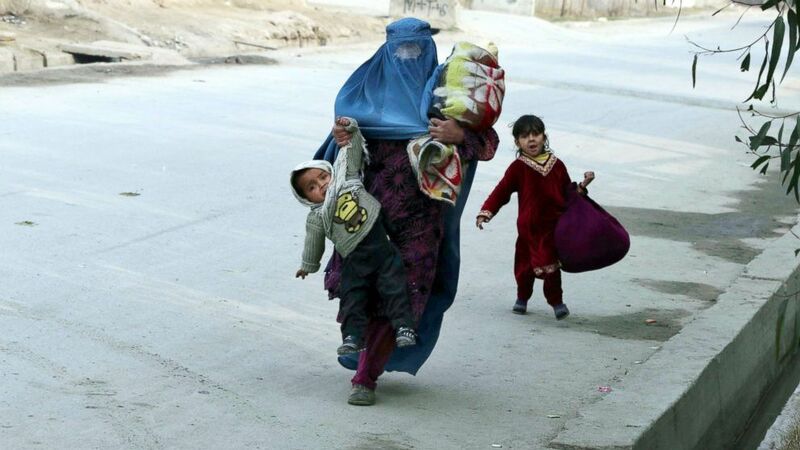 An Afghan man runs with two children near an office of the British charity Save the Children during an attack in Jalalabad, Jan. 24, 2018. Four of the six killed worked for Save the Children. Of the 28 injured, 25 were civilians and three were members of the police special forces, authorities said. Four attackers were also killed. Smoke rises at the site of a blast near the office of the Save the Children aid agency in Jalalabad, Afghanistan, Jan. 24, 2018. London-based Save the Children has operated in Afghanistan since 1976, aiming to provide better access to education, health care and essential supplies.